Cyclezone is a mountain and road bike shop in Crowthorne, Berkshire. It is situated opposite Crowthorne Train station and also has parking right out front, giving easy access for everyone. It’s just down the road from Swinley Forest and some great riding, so well located in general. The shop itself was clean and inviting – a good modern layout which had well thought out. There are full workshop facilities on site too. 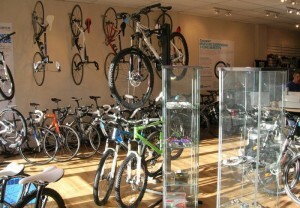 They mainly stock Trek (they are an authorised dealer), but do Genesis and Saracen as well. In the shop they had a reasonable variety across the ranges, if not a particularly large stock – so not much in the way of different sizes to try, but you could see each bike. It was also good to see women-specific bikes in the shop too, as this is something that still sadly often gets relegated to “order only”. Although I’m mountain bike focussed, the shop display was about 50:50 MTB to Road bikes. There was also a good selection of accessories on display from helmets and tyres to nutrition, clothing and spare parts. The staff were friendly and very knowledgeable. We had a good discussion on what I needed from a bike, which isn’t completely mainstream, as well as a thorough discussion on sizing for before coming up with some recommendations. All very good service. Cyclezone is a demo centre for Trek, and they have a good selection that can be booked out for trial rides. This is a great way to be sure of your purchase, especially for the more expensive and specialist machines. The trails around Swinley are a good test ground too. In all a really nice, quality bike shop.